This story is about Sibusiso Mogale, the greatest young man we know. 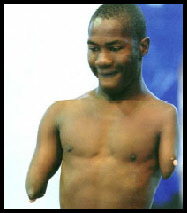 Sibu was born on the 28th December 1987, with adeformity called Phocomelia (he was born without arms). Despite this, Sibu has gone on to represent South Africa in swimming - breaststroke and butterfly, and he missed out on the 2008 Paralympics in Beijing by a few seconds photos below. He has also swum the Midmar Mile in under 40 minutes. We hereby ask for your generous support in assisting us to raise funds to enable us to have prosthetics manufactued for Sibu.